My (@rogerjenn) live OakLeaf Systems Azure Table Services Sample Project demo runs two small Windows Azure Web role instances from Microsoft’s South Central US (San Antonio, TX) data center. This report now contains more than a full year of uptime data. I didn’t receive Pingdom’s Monthly Report for July expected on 8/3/2012. This is the fourteenth uptime report for the two-Web role version of the sample project since it was upgraded to two instances. Reports will continue on a monthly basis. See my Republished My Live Azure Table Storage Paging Demo App with Two Small Instances and Connect, RDP post of 5/9/2011 for more details of the Windows Azure test harness instance. I believe this project is the oldest continuously running Windows Azure application. 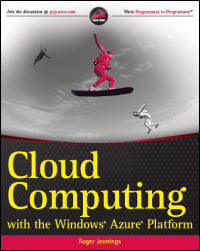 I first deployed it in November 2008 when I was writing Cloud Computing with the Windows Azure Platform for Wiley/WROX, which was the first book published about Windows Azure. The application runs the default set of Windows Azure Diagnostics. About 5 GB of Event Counter data provides the source data for my Generating Big Data for Use with SQL Azure Federations and Apache Hadoop on Windows Azure Clusters post of 1/8/2012.